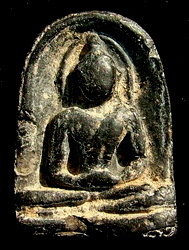 Phra Somgor were first discovered on B.E. 2392 in Wat Phra Boromathat, Kamphaeng Phet province. 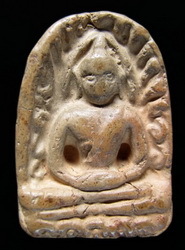 The amulets were created in the era King Phra Maha Dharmarajalitai, the 5th king of Sukhothai. Phra Somgor is a mixture of Sukhothai-Lanka (Sri Lanka) style. It form a sitting posture of a thumb shape. According to memorandum of Wat Phra Boromathat, Phra Somgor amulets were made by 11 hermits or Phra Lersi using special materials and invited Devadas to create the molds. There is a slogan for Phra Somgor " If you have me, you never get poor". Estimated to be made some 550 years. 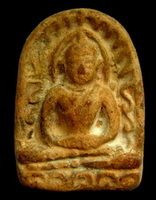 The great discovery of the Buddha amulets from Kamphaeng Phet Province otherwise known as The Millionnaire Field (Thung Setthi) was discovered when the reverend Somdej Phra Puttajarn Toh Prommarangsi from Wat Wakang went to visit his relatives in Kamphaeng Phet Province in BE 2392 (AD 1849). He read the stone inscription on the third pillar and instantly knew that in Kamphaeng Phet Province there was an ancient city and a big pagoda up north of Nakhon Chum City. These were the first discovery at Wat Barommathat, the temple of a big pagoda and the 3 pagodas, and also the Buddha amulets of Kamphaeng Phet Province family with beautiful Buddhist art forms with the uniqueness of its own. At later time, the people then reconstructed the pagoda of Phra Srirattana Maha That and found old text books on the long lost making techniques of Soom Kor Buddha amulets in the past.The old Sankrit inscriptions in the texts describes the ancient city filled with abundance of Buddha amulets.Nakhon Phra Chum was then named as a city of Buddha amulet collection. According to record where the Chedi of Wat Barommathat in which the inscription was found, during demolition for reconstruction a huge number of old Phra Soom Kor amulets were discovered. This is the location source of ancient amulets findings that is popularly known today as the "Millionaires Field". Phra Kamphaeng of the Millionaire's Field has a famous quote according to the old text scripts "If you carry me, you will never be poor". This is such superb amulets qualities from Kamphaeng Phet that had attracted strong admirations from all amulet collectors' circle. This Millionaire's Field amulets include the other family of Phra Kamphaeng Soom Kor, Phra Kamphaeng Met Khanun (jack fruit seeds) otherwise known as Lila Thung Setthi the walking Buddha posture. In general there are basically 2 types of Phra Soom Kor. Kanok decorated types: there are 3 sizes; big, medium and small. Non-Kanok types: mostly in black or brown color. In addition to the marvelously beautiful art, the earth texture of Phra Kamphaeng is second to none when comparing with amulets from other cities. The texture contains flower petals and they are especially soft. There are 5 prints altogether namely big print with decorative design, big print without decorative design (Sum Kor black), medium print, small print and "pia" cake print and of course Phra Kamphaeng Met Khanun which look similar to a jack fruit seed.